Caption: (from left) Crime Line’s Marisa Oosthuizen, head Yusuf Abramjee and Lead SA’s Catherine Constantinides. PMR.africa has presented Crime Line head, Yusuf Abramjee with the Diamond Arrow award 2013 for Corporate Social Responsibility initiatives. PMR.africa hosted its annual “Muslim Business Survey and Achievers Awards” ceremony in Rosebank Johannesburg today. The survey was “rated by a random sample of 100 respondents comprising of CEO’s, MD’s, business owners, company directors and managers and senior community leaders representing the Muslim Community in Gauteng,” said PMR.africa’s Johan Hatting. “Yusuf Abramjee received the highest rating from this year’s survey – Outstanding…1st overall” said Hatting. Crime Line is an anonymous tip-off service and it was launched as a Primedia group initiative over six years ago. Thanks to anonymous tip-offs from the public, thousands of criminals have been arrested and millions of Rands of drugs, stolen and counterfeit property have been seized. Crime Line recently scooped two top awards at the annual Crime Stoppers International (CSI) conference in Barbados. In April this year, Abramjee received a national order, the Order of Baobab, from President Jacob Zuma for “community development” – the highest recognition a government can give a citizen. CSI President, Alex MacDonald; Divisional Commissioner: Detective Service, Lieutenant-General Vinesh Moonoo; Crime Stoppers Barbados Chairwoman, Julie Dash, Head of Crime Line and CSI Vice-President, Yusuf Abramjee; Crime Line Coordinator, Marisa Oosthuizen and Crime Stop Station Commander, Colonel Dr Attie Lamprecht. The anonymous tip-off service, Crime Line scooped two top media awards at the 34th Annual Crime Stoppers International (CSI) Conference in Barbados this week. This as South Africa prepares to host the conference in Cape Town next year. Head of Crime Line and CSI Vice-President, Yusuf Abramjee serves on the board of directors together with Lieutenant-General Vinesh Moonoo and Colonel Dr Attie Lamprecht from the South African Police Service (SAPS). South Africa was also represented this year by Crime Line co-ordinator, Marisa Oosthuizen. The team represent Crime Stoppers Southern Africa (CSSA) that so far include the Crime Line and Crime Stop programmes. CSSA secured the bid to bring the international conference to the African continent for the first time. Crime Line received media awards in the radio and television categories for crime stoppers campaigns for communities over 3-million. “We are honoured to end three days of intensive training on a high note with these awards. We believe it to be a positive precursor to the 35th CSI conference that will be held in South Africa,” said Head of Crime Line, Yusuf Abramjee. “The conference provides us with an opportunity to bring crime stoppers from around the world to our shores to share ideas and the latest trends in global crimes. Crime knows no borders and it is therefore vital for us to forge these bonds with foreign partners,” Abramjee added. CSSA has selected Cape Town as the host city for the October 2014 prestigious conference and will open registration next month. The conference promises to cover a variety of crime topics with expert speakers from all corners of the world. 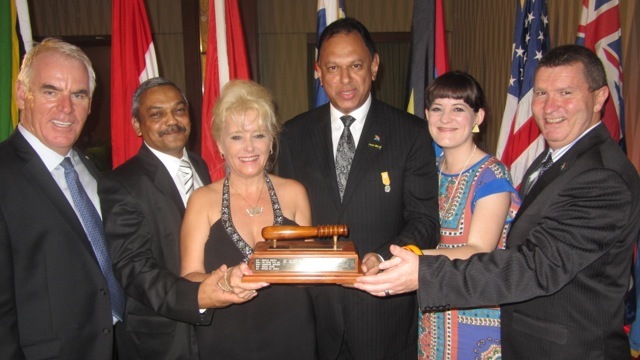 Barbados Crime Stoppers handed the baton to the SA team at a gala dinner last night. In a video message, President Jacob Zuma said the country was looking forward to welcoming crime fighting activists to SA. Abramjee said it was significant that the world conference was coming to SA in the same year when the country will be celebrating 20 years of freedom. “This past week highlighted the prevalence of organised crime around the world and our need as crime stoppers to continue being a step ahead of the criminals who drive it. We aim to provide delegates with the latest trends and workable ideas and initiatives that they can take back to their communities,” said Abramjee. “This is also an opportunity for us to showcase the various organisations and NGOs that form part of the Southern African crime fighting community. We will also be inviting our counterparts from other parts of Africa with the view of incorporating them into the CSI fold,” Abramjee added. This past week delegates heard that tip-offs from members of the public were proving to be more effective than conventional methods to fight crime. The establishment of dedicated anonymous tip-off lines in CSI member countries have shown significant reductions in crime. It has additionally served to strengthen and improve relations between the public, police and the media. Colonel Dr Lamprecht who runs the Crime Stop programme said SA continues to make “great strides” and tip-off volumes were increasing. Oosthuizen said initiatives such as Drug Watch – a Crime Line partnership with the SAPS, Lead SA and the Community Police Board of Gauteng showed how effective tip-offs and police action can be. Over 27 000 arrests have been recorded since 27 June in Gauteng. She added that over recent months especially more detailed tip-offs were also coming in about other crimes. Members of the public can send detailed anonymous tip-offs to Crime Line’s 32211 SMS service (Costs R1), call Crime Stop on 08600 10111 or submit tip-offs online at www.crimeline.co.za. From left: CSI President, Alex MacDonald; Divisional Commissioner: Detective Service, Lieutenant-General Vinesh Moonoo; Crime Stoppers Barbados Chairwoman, Julie Dash, Head of Crime Line and CSI Vice-President, Yusuf Abramjee; Crime Line Coordinator, Marisa Oosthuizen and Crime Stop Station Commander, Colonel Dr Attie Lamprecht. For the latest news, breakthroughs and alerts follow @CrimeLineZA.